Have you ever been skeptical about your yams? Ever maybe wondered why yams and sweet potatoes are even different? Here’s the truth: yams and sweet potatoes are entirely different and completely unrelated. Even more surprising, your typical grocery store ‘yam’ is most likely a sweet potato imposter: not a yam at all. According to Kitchn, grocery stores across America typically label the softer sweet potatoes that have an orange hue to their skin and inside as yams. Harder sweet potatoes with lighter yellow skin and flesh are labeled ‘Sweet Potato.’ True yams are native to Africa and Asia (Kitchn). In America, yam and sweet potato often seem indifferent terms, yam being a common ‘nickname’ of sorts for a sweet potato. As Smithsonian states, real yams can grow to weigh 100-150 pounds and be about four or even five feet long. 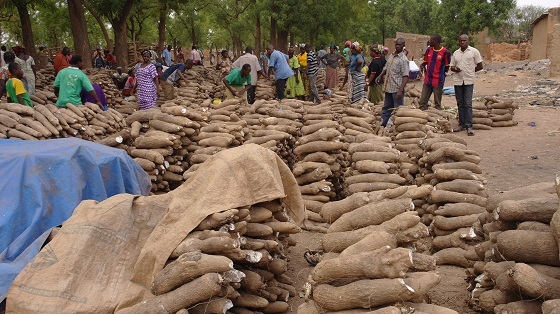 In western Africa these yams and especially the white yam species provide nutrition for millions of inhabitants, according to Smithsonian, and are shipped internationally for sale as well. According to ZODML, in Igboland, which is southeast of Nigeria, yams are celebrated with the New Yam Festival, occuring between Aug. and Oct. Around the time of the harvest, yam festivals bring together various tribes in thanking their gods for a plentiful harvest of yams. Much like an American Thanksgiving celebration, the New Yam celebration is an opportunity for families to come together and give thanks for plentiful food. The festival begins with an offering of yam to the gods of the yam and the earth, and following all those gathered together for the celebration enjoy the first yams of the harvest.